Spanning May 17 to June 15, 1939, the Royal Visit by King George VI and Queen Elizabeth marked the first Canadian visit by a reigning monarch. The mood was joyful, but the aim was serious: to muster support for England in a time of imminent war. For the young Clare Bice, 1939 was a successful year. He was elected to the Ontario Society of Artists and exhibited at the New York World’s Fair. 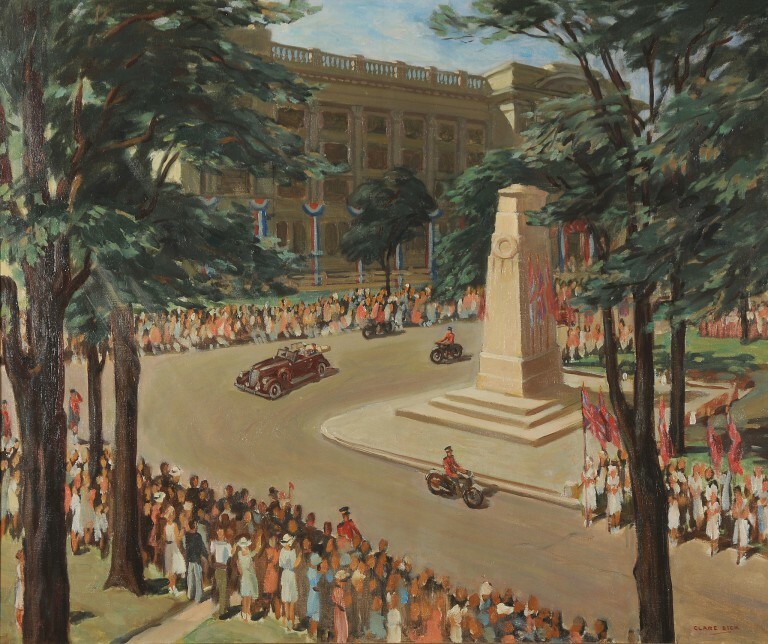 He established a studio at 508 Wellington Street—a short walk from the Victoria Park Cenotaph depicted in this view. Bice could not know that he, too, was poised on the brink of momentous change. 1940 began his 32-year relationship with the London Public Library and Art Museum. This relationship would mean less time to develop his artistic career, but remarkable influence on the local art scene. In Royal Visit, Bice captures the moment of arrival. The scene is celebratory yet decorous, an impression heightened by the faceless figures and distanced perspective. The painting’s greatest movement is rendered in the blur of trees and shafts of sunlight framing the scene. Bice’s controlled brushwork and representational style would loosen and become more abstract in his later works.